Hundreds of people gathered at Thomas Paine Plaza on Oct. 10 for Philadelphia’s fifth annual Trans* March [“trans*” is a word currently used with an asterisk to indicate the spectrum of all the different genders of people who do not conform to the either/or of male/female — WW]. The rally across from City Hall was followed by a march through city streets that received broad and very positive support, with several people honking car horns or joining along the route. 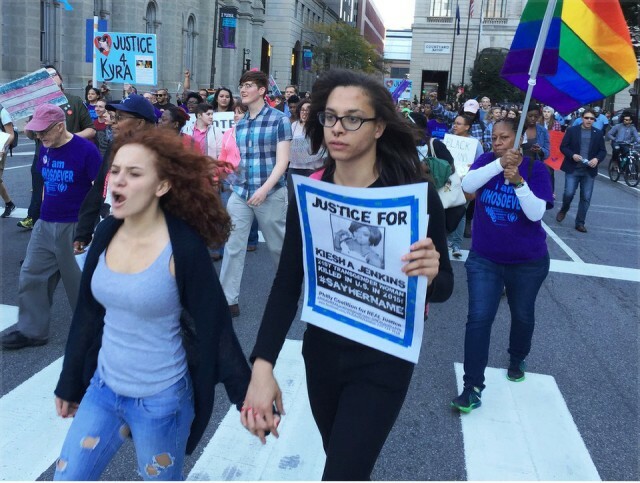 The event took on particular significance in the wake of the murder of 22-year-old Kiesha Jenkins, a Black transgender woman. Jenkins was on her way home early in the morning of Oct. 6, when she was brutally beaten by five or six men, and then shot twice in the back as she lay on the ground. While Philadelphia police are trying to portray this as a “robbery gone wrong,” the Jenkins family insists it was a hate crime. Members of her family joined in the demonstration. Jenkins is the 20th transgender person murdered in the U.S. in 2015 and the 18th transgender person of color. The Philadelphia Coalition for Racial, Economic and Legal Justice, which participated in the march, brought signs demanding justice for Jenkins. REAL Justice organizer Erica Mines, speaking at the concluding rally after the march, read the names of transgendered individuals killed as the crowd responded, “Say their name,” after each one.